(CNN) -- A Missouri police officer shot and killed a teenager Tuesday night in Berkeley, Missouri, just 2 miles from the St. Louis suburb of Ferguson, where Michael Brown was killed by police, an event that set off protests across the country. Surveillance video appears to show a person -- identified by police and his family as Antonio Martin, 18 -- pointing a gun at an officer in a gas station parking lot in Berkeley right before the officer fatally shot the teen, Berkeley Mayor Theodore Hoskins told reporters Wednesday. The shooting led to a tense couple of hours at the station, where scuffles with police broke out -- and what appeared to be lit fireworks were thrown -- as scores of people gathered to see what happened in an area still emotional over the August 9 shooting of Michael Brown. Hoskins promised a thorough investigation. 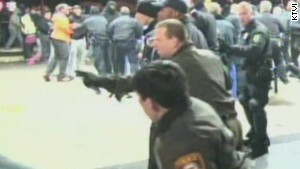 "I will not tolerate brutality of any policeman on our citizens," Hoskins told CNN. He added that people can "rest assured that I will investigate this independently and make a complete report to the community." Gov. Jay Nixon issued a brief statement saying, "The events in Berkeley are a reminder that law enforcement officers have a difficult, and often dangerous, job in protecting themselves and law-abiding citizens." A small group of protesters marched along some roads, including a highway, on Wednesday night, with some help from police. "Police are actually blocking the intersections for the protesters," St. Louis Post-Dispatch reporter Nicholas J.C. Pistor tweeted. Still, six to eight protesters were nevertheless arrested for blocking off part of I-170 in Berkeley, CNN affiliate KMOV reported. Martin faced a series of criminal charges over the past 15 months according to KMOV, including assault, armed robbery, unlawful use of a weapon, armed criminal action and stealing. The station showed Martin's tearful mother Toni Martin saying her son was "trying to get his life back together." County Police Chief Jon Belmar said the shooting was tragic, but stressed the teen pointed a gun "straight out" at the officer, who fired in self-defense. "I understand the emotions ... but I think we need to understand the context of what happens ... with these types of situations," Belmar, whose department is investigating the shooting, told reporters. Belmar said the officer, a 34-year-old, six-year Berkeley police veteran, was responding to a report of a theft when he pulled into the parking lot of a Mobil gas station in Berkeley shortly before 11:15 p.m. He left his cruiser and talked to two men in the lot. Eventually, as the officer stood by the driver's side tire of his cruiser, one of the men backed away from the cruiser's passenger side headlight, then stepped forward again pointing a gun at the officer, Belmar said. The officer, whom police did not name, lost balance and fell as he moved back in reaction, but managed to fire what investigators believe were three shots, hitting the gunman at least once, Belmar said. The slain teen is not believed to have fired his weapon, a loaded 9 mm handgun that police recovered at the scene, Belmar said. Police later released a photo of the weapon. Meanwhile, there was a shooting in St. Louis on Wednesday. CNN affiliate KMOV reported one person was shot to death and three were in critical condition. No other details were immediately available. In the Martin case, video released by authorities showed a second man nearby who fled when the shooting occurred. Authorities are looking to interview him. Martin's father, Jerome Green, said his son had indicated he was going out to meet his girlfriend and had not mentioned any other person who might be with them. "He was supposed to come home," Green said. "We're getting ready for the holiday; everyone wanted to see him. My grandmother hadn't seen him for a while." The officer involved was given a body camera before he left for patrol, but he wasn't wearing it during the shooting, possibly because he was distracted when a supervisor gave it to him earlier Tuesday, Belmar said. Hoskins said this didn't bother him, in part because the city, with three cameras for its 31 officers, had just started training officers to use them. The cruiser's dashboard camera also wasn't recording, because the car's emergency lights hadn't been activated, Belmar said. The officer will be placed on administrative leave until the investigation is completed. 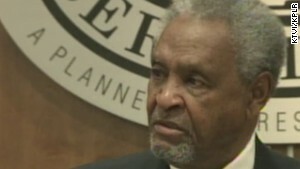 Green said Martin lived with his parents, brother and sister. Protesters late Tuesday and early Wednesday gathered around an ethnically diverse group of dozens of police officers, who stood between them and the scene. People in the crowd screamed at police. Others spoke more calmly. 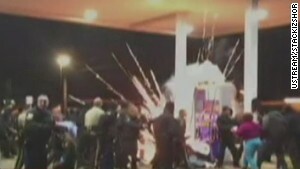 What looked like a firework exploded near a gas pump, scattering people and temporarily filling the area with thick, white smoke, video from CNN affiliate KMOV showed. Four people were arrested on suspicion of assaulting officers, Belmar said. One police officer was sent to an emergency room after injuring himself while trying to get away from the firework, Belmar said. Another officer was treated at a hospital after being hit in the head with a rock or a brick, Belmar said. St. Louis Post-Dispatch photographer David Carson said some of the protesters damaged police cars. CNN showed images of one squad car with a large dent in its side. KMOV video showed a white plume rising at another location down the street. Belmar said someone had tried to set a fire at a nearby store, but someone extinguished it. Tuesday's incident came about a month after a St. Louis County grand jury declined to indict Ferguson Police Officer Darren Wilson for fatally shooting Michael Brown on August 9. Authorities said Brown, who was black, wasn't armed at the time, but that he tried to take Wilson's gun while the officer was in his vehicle during an encounter in Ferguson. Some witness accounts said Wilson left his car and eventually fired while Brown, 18, had his hands up in surrender, but others disputed this. Police said Wilson fired in self-defense as Brown charged him. Berkeley is a city of about 8,000 people flanked by St. Louis International Airport to the west and Ferguson to the east. CNN's John Branch, Sara Ganim, George Howell and Rick Martin contributed to this report.